Something must be working well when a group of educators/researchers/clinicians leave a lunchtime meeting chatting to each other with a palpable buzz of energy. 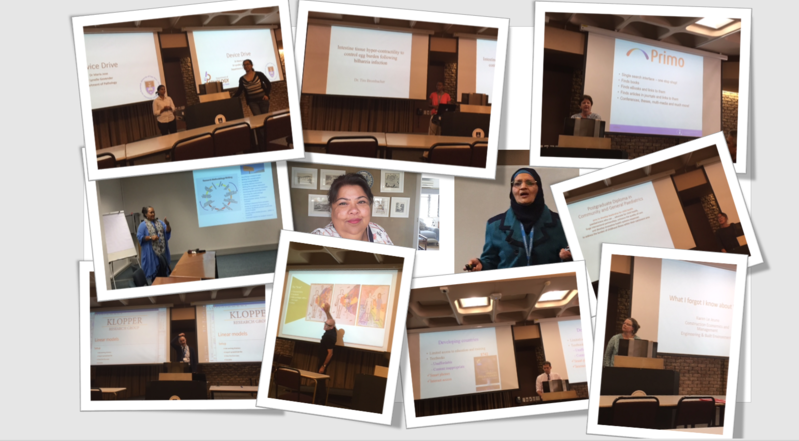 SInce September 2017 we have facilitated six Teaching & Educating with Technology Talks, known as TET Talks. Faculty staff are invited to share ideas for teaching and research, using technology. Others come to listen to the four presentations of no longer than 12 minutes each. The response has been overwhelmingly positive with a waiting list of prospective speakers. These sessions are opening up interdisciplinary spaces for educators to share creative ideas, experiences and their use of technology in their teaching and research practices. For the presenters, the TET Talks offer an opportunity to showcase their innovative processes, as well as discuss and seek feedback from their peers. Attendees come with a sense of curiosity, with opportunities to connect with others, to hear, to listen and interact with new ideas in different departments thereby opening up communication across disciplinary silos. We look forward to opening up these sessions also to students. TET Talks provide a productive space for us all to learn from each other in these fast changing times.